Thank You For Your Purchase of a Gaines Product! Subject to the exclusions, limitations, disclaimers, limitations of remedy, and limitations of liability of this warranty, Gaines Manufacturing, Inc. warrants that its product shall be free from defects in material and workmanship for the period of one (1) year from the date of purchase. RETAIN YOUR ORIGINAL PROOF OF PURCHASE. THE OBLIGATIONS OF GAINES MANUFACTURING, INC., AND THE RIGHTS AND REMEDIES OF PURCHASER/CLAIMANT SET FORTH IN THIS LIMITED WARRANTY ARE EXCLUSIVE AND IN SUBSTITUTION FOR ALL OTHER WARRANTIES, OBLIGATIONS AND LIABILITIES OF GAINES MANUFACTURING, INC. NO OTHER WARRANTY IS EXPRESSED AND NONE SHALL BE IMPLIED, INCLUDING, WITHOUT LIMITATION, THE WARRANTY OF MERCHANTABILITY OR WARRANTY OF FITNESS FOR USE OR FOR A PARTICULAR PURPOSE. Any Gaines product which has been damaged as a result of installation contrary to any of Gaines’ written installation instructions is not covered by this warranty. 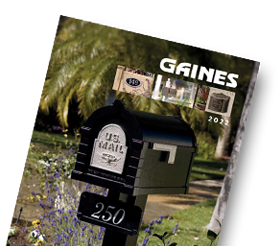 Any Gaines product which has been damaged as a result of any testing, adjustments, or modification that is contrary to any Gaines’ written instructions is not covered by this warranty. Any Gaines product which has been modified by any non-Gaines component is not covered by this warranty. Any Gaines product having a defect caused by neglect, accident, misuse, abuse, use in a manner that is not normal or customary; or extraordinary use or maintenance is not covered by this warranty. Any discoloring, peeling, scratches, cracks, or similar defect in product finished caused by or deemed a direct result of environmental factors outside the control of Gaines Manufacturing Inc., is not covered by this warranty. No warranty is made that the Gaines product will meet your requirements or will work in combination with any products provided by third parties. If a claim is made under this warranty and, after investigation by Gaines Manufacturing, Inc., proves to be valid, Gaines Manufacturing, Inc., will, at its sole option, either repair or replace the products that do not conform to this limited warranty. We may use functionally equivalent reconditioned/refurbished/pre-owned or new Gaines products or parts. Upon such a repair or replacement, the original remaining warranty period will continue in effect and be applicable to the repaired or replacement Gaines product. Except as expressly provided in this limited warranty to the contrary, GAINES MANUFACTURING, INC., SHALL NOT BE OBLIGATED OR LIABLE FOR LABOR OR OTHER COSTS RELATED TO INSTALLATION, REPAIR, OR REPLACEMENT OF ANY OF ITS PRODUCTS OR FOR LOSS OF, OR DAMAGE TO, ANY MATERIAL WHICH IS NOT SOLD BY GAINES MANUFACTURING, INC.
GAINES MANUFACTURING, INC. SHALL HAVE NO LIABILITY WHATSOEVER FOR SPECIAL, INDIRECT, CONSEQUENTIAL, INCIDENTAL OR EXEMPLARY DAMAGES UNDER ANY CIRCUMSTANCES, WHETHER BASED ON TORT OR BREACH OF CONTRACT CLAIMS OR ON ANY OTHER BASIS, TO THE FULL EXTENT THESE DAMAGES MAY BE DISCLAIMED BY LAW, EVEN IF IT HAS BEEN ADVISED OF THE POSSIBILITY OF SUCH DAMAGES. THE MAXIMUM LIABILITY OF GAINES MANUFACTURING, INC., IF ANY, SHALL BE LIMITED IN ALL EVENTS, AND SHALL NOT EXCEED THE PURCHASE PRICE OF THE PRODUCT UPON WHICH THE CLAIM OF LIABILITY IS MADE. All claims and other communications under this warranty must be made to the purchaser/claimant’s Gaines dealer or retailer. Each claim must be in writing, briefly describe the defect, and be accompanied by a proof of purchase. The purchaser/claimant must provide to his or her Gaines dealer or retailer other information and evidence reasonably required by Gaines Manufacturing, Inc., and, if requested, must permit inspection of the product by Gaines Manufacturing, Inc., or its representatives. Gaines Manufacturing, Inc., reserves the right to request purchaser/claimant submission of product claimed to be defective.